We invest time and money to protect our homes and property, and often without realizing it, leave our horses vulnerable to theft from home, at shows or while traveling. Most of us personally know at least one person who has suffered the horrific violation of having a horse stolen. It’s time for the equine community to band together and take every step possibly to prevent horse theft. The measures provided can, at the very least, make it very uncomfortable for a thief to target and successfully profit from the theft of YOUR horse. #10. Brand, microchip or tattoo. While all three methods are beneficial, we at EQR highly recommend freeze branding. A branded horse is not a good target of theft, and will most often be passed over in preference of an unbranded target. A brand greatly increases expedient, successful owner identification. A brand registered with your state can be used as proof of ownership. A brand registered with EQR provides a route for national identification and internet search-ability within our database, accessible by the public, law enforcement and animal welfare. A horse with a brand is carrying his own source of identification which can not only help deter theft, but bring him home in the event of loss or natural disaster. #9. Truck & Trailer Decals. Chances are you personally know at least one person or family who have had their trailer stolen from a show, event, camping or even from home. Often, including their precious horses and valuable tack. The personal, emotional and financial loss can be phenomenal. By adhering vinyl truck and trailer decals, your property becomes much less desirable a target. As EQR members, you may special order decals containing YOUR personal brand, farm name, and EQR emergency contact information, making it easier to identify your trailer from long distances. EQR works with our members and law enforcement in the event of theft to help in identification of property and provide media blasts not only to law enforcement, but to the public as well. The best defense is to deter theft and make your property the least desirable target. As a second defense, EQR will make it very hard for whomever stole your property to hide! Members: it is critical to keep your EQR membership profiles current and up to date with photos of your registered horses and trailers so that we BEST SERVE YOU should you need us. Marking the underside of your tack can help make identifying your property easier as well as deter prospective thieves. A number of methods may be used to mark your tack, including; permanent marker, leather engraving, identifying conchos and other silver type embellishments. 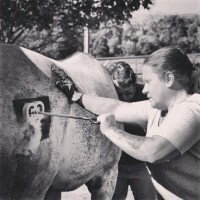 Many of us at EQR prefer branding the undersides of our tack and recommend this method of marking tack. When you order a branding iron from Pittsburg Foundry, you can also purchase a mini-iron perfect for such tasks. The mini-iron can also be used to brand steaks, wood decor and other items. By the way, all EQR members receive a discount coupon from Pittsburg Foundry saving members $40.00 off typical market price AND includes a FREE truck/trailer decal with your brand. Now, your horses, truck/trailer and tack all carry your brand! We often load up one or two horses and haul for a day of riding, leaving the rest of the herd at home. Not to mention long periods of time we may be away due to work or other reasons. These are times when neighbors or passersby may be the only eyes on our horses. What if our horses get out? Or are seen ‘down’ in their pasture, sick or injured? Often our neighbors have no idea what to do or how to handle an equine emergency, and no way to contact the horse owners. Every EQR member receives a free outdoor emergency sign which can be mounted on a fence post, gate or barn. Additional signs may be purchased at any time. Each sign contains the EQR ‘hotline’ phone number, which is answered 24/7. Anytime an at-home emergency call is made in behalf of one of our member’s horses, EQR will personally contact that member with a report. Your privacy is ensured while a contact number is publicly posted for neighbors, passersby or even the police to be able to get word back to you regarding any emergency at home, through EQR. THAT’S security! d. Description of mark or brand and written description of all unique characteristics. All EQR members have the option of privately storing a digital copy of all such papers in their EQR membership profile, as well as current coggins test. All stored documents are for our member’s use only, and can be accessed by logging in to your membership profile from any location where internet is available, by computer, cell phone or other web enabled device. Documents may be printed from your file. Your documents are kept safe and will always be there should you need them for any reason, whether to assist in proving ownership or to temporarily replace lost or damaged originals. This EQR service is free, and is included in all memberships. #5. House Away From the Road. If you plan to build a barn or corral, locate it away from the road. Place facilities beyond your house if at all possible. They are less likely targets if they are more difficult to access and require thieves to pass a house. Lock gates to pastures that can be entered from the road. Do not hang halters and lead ropes on stall fronts, corral gate posts or anywhere in the open. Secure halters in a locked tack room or feed room. Never leave halters on pastured horses. 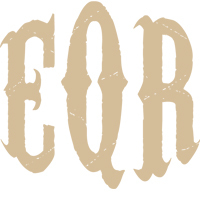 EQR endeavors to provide theft prevention measures, deterring potential theft by publicly informing visitors that your farm and horses are protected by membership with EQR. While EQR is not law enforcement, we believe that by working closely with law enforcement, sale barns, veterinarians, branding professionals, state brand registration entities, animal control agencies, borders/customs, and all forms of public media, that equine theft can be deterred and thwarted, and that horses may enjoy a life-line of security in an often cruel and unforgiving world. #4. Photograph horses and keep photos current. Photograph both sides of the horse as close as possible, being sure to get the entire horse in the frame. Although saddles, blankets, leg wraps and people may look good in a photo, they often impair the photo’s usefulness for identification. Take close-up pictures of any unique, identifying characteristics such as a brand, permanent scar or white markings. At EQR, we recommend taking side views, both sides, with all 4 feet showing. Front and rear photos are certainly helpful as well. Within each EQR Member Profile, is an area where members are to upload photos of each of their horses, enter identifying marks, brands, microchip info, tattoos, etc. Members may also store digital scans of registration papers, current coggins, health papers, immunization and deworming records, so forth. This is a free service to all our members and a handy way to keep all your important documents and identification photos in one convenient location, accessible from any computer, smart phone or other web enabled device. #3. Be able to identify quickly and without doubt. “All my horses are branded and micro chipped. In case of theft or escape, I want to be able to identify mine quickly and without doubt.” Steve Jones, 33 years with LSU and the Arkansas Extension Services and State Equine Specialist. Horses and equipment are stolen from barns, farms, pastures, boarding and training facilities, competitive events-even from backyards. Tracking stolen horses can be difficult because theft reports are often delayed and stolen horses can change hands frequently and at remote locations. EQR members have a strong support system, first to assist in DETERRING theft, and second to QUICKLY assist in publicizing theft to the proper sources, media and public, and finally to assist in recovery and return in the unfortunate event of theft. Membership with EQR provides a lifeline to your equine companions and stock! #2. Lifetime registration with EQR. Upon joining EQR, members have the option to purchase a Lifetime Registration for each of their horses. Each Lifetime Horse remains in the EQR database as long as he/she lives. Registration is transferable from owner to owner for the life of that horse, and is given as a certificate. Should a horse end up in an undesirable situation years down the road, EQR will contact the person of interest who registered that horse, providing them the opportunity to rescue the horse and bring him back home, regardless of whether that person’s membership had been maintained over the years. Brooke Ferguson, pictured here, has played a very active role in rehabbing and rehoming rescue horses through her family farm, Journey’s End Horses, where each rescue is given Equine Quick Response’s “Lifeline for a Lifetime”, to ensure they will always have a way back home. #1. All of the Above. In the age before the automobile, horse theft was a serious offense. After all, a horse was a person’s transportation, and in the case of a farm animal, a source of income. 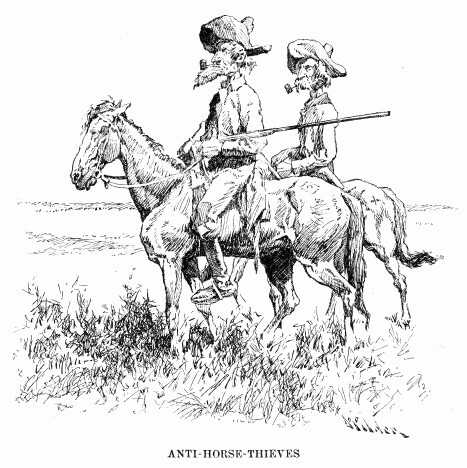 As the United States was in its growth stages, horse thieves flourished in the frontier areas of the country. A thief could steal a horse and hurry him across state lines or into the Indian territories where local authorities could not easily follow. It was easy, and it was lucrative. Horse theft was a particular problem in Clark County, Missouri located on the border of Missouri, Iowa and Illinois. A horse could be stolen, crossed over the nearby Des Moines River or the Mississippi River and out of the state by morning. The horses were seldom recovered, since it typically cost more to go after them was more than they were actually worth. 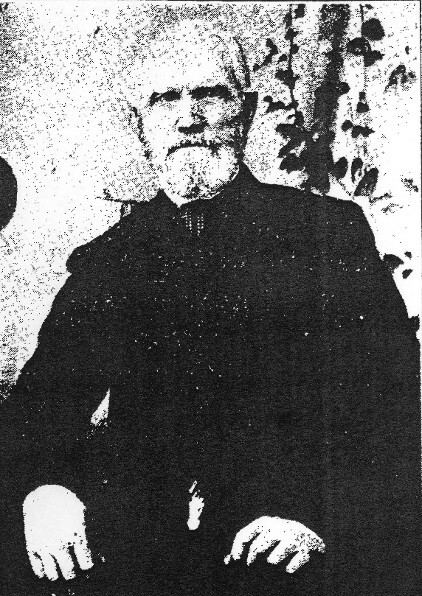 Major David McKee of Clark County and a group of his friends formed The Anti-Horse Theft Association (AHTA) in 1853 to combat the problem. There was one major unforeseen problem with their organization. With the advent of the American Civil War, most of the members, including Major McKee, enlisted in the army. Thievery only got worse with the chaos of the war. Rogues became more reckless and desperate—especially with stealing horses and cattle. When Major McKee was discharged from service in 1863 due to a disability, the need for a way to curtail horse theft was greater than ever. He once again started up the group with great success. 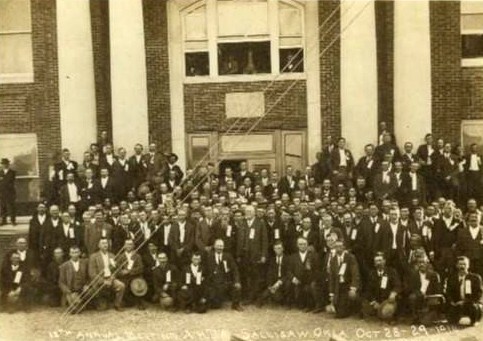 The AHTA grew and spread to many states and reached a peak membership in 1916 of 50,000. The AHTA was not a group of vigilantes, who would chase after horse thieves, catch them and hang them from the nearest tree. They did dole out justice; not from a limb of a tree, but through the courts. The group believed in supporting and upholding the law, and the last thing they wanted to do was break the law. Rather, they worked hand in hand with law enforcement, gathered evidence and testified in court to punish horse thieves and other criminals. This is probably why the organization grew so large. It was a way for law-abiding citizens to bring order into their lives by working with law enforcement rather than becoming helpless victims. Although it was a “secret” organization, nearly any man could join. To become a member of the AHTA, it was only necessary that you be a citizen in good standing, male and over eighteen years old. Women weren’t completely kept out of the organization. In later years, widows of members were allowed to continue their membership when their husbands died. In addition, some chapters had Lady Auxiliaries that did good works and aided in social functions. There were no salaried positions in the AHTA. Everything was done on a voluntary basis with only expenses paid. This kept membership relatively inexpensive. 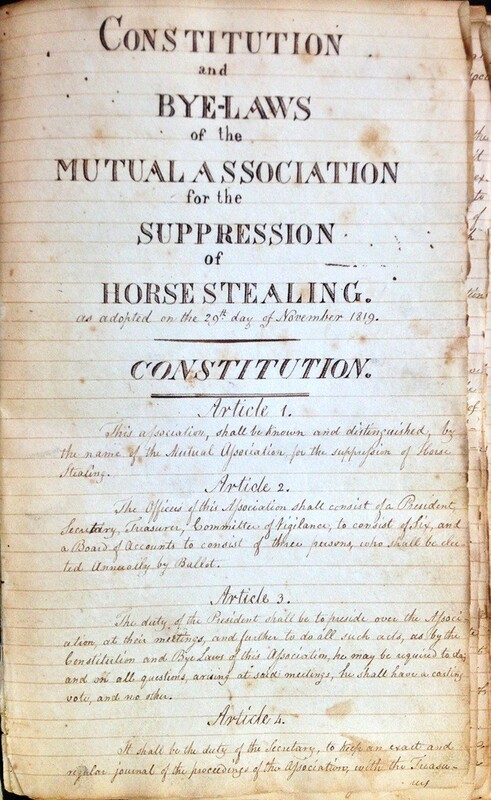 Once you were a member, if you had a horse stolen (or other property) you would report it to the president of the group. At that point, certain actions would be put in motion. The telegraph, and later, the telephone were used to warn authorities and other chapters of the AHTA of the theft with a description of horse, and if known, the thief. In this manner, the thief was quickly surrounded by people on the lookout for him. The president would then assign ten or more members of the AHTA to hunt for the trail of the thief. Once the trail was discovered, at least two of the members and the owner of the horse would then be assigned to pursue the thief for as long as there was a trail to be followed—regardless of time or expense. It didn’t matter if the horse was worth $25.00 and it cost $100.00 to retrieve him. It was a matter of principal. Once the thief was caught, he was turned over to the Vigilance Committee. It consisted of six men who would determine if there was sufficient cause for prosecution. At that point, they would turn him over to the authorities and personally assist in prosecution. If you were picked to pursue the thief and refused without a reasonable excuse, you had to pay a fine of $5.00. If you did agree to join the chase, all of your expenses would be paid. If you weren’t a member, and you needed help to recover a horse, the AHTA would still help you, but you had to pay them for the services. Any member who reported that a horse was stolen, and later found out that he just wandered off would have to pay for the expenses incurred in the search for his horse. The AHTA also had a publication where they listed missing horses and property called the AHTA Weekly News. It was devoted exclusively to items concerning the organization, horse thieves and other livestock and property theft. The publishers also liked to list any particularly steep sentences given to horse thieves to use as a scare tactic to prevent future thefts. At its peak, it had a circulation of over 20,000. One of the reasons the AHTA was so successful was because the members didn’t have to worry about crossing state lines when they were bringing back the thief. This was a problem for law enforcement officers because of the slowness in getting extradition orders. Major McKee devised a clever way around this. This is how it worked. If the thief was chased into Iowa, part of the group would stay behind in Missouri; close to the state line. When bringing the thief back, they would take him to the line and tell him to, “get out of Iowa and do it quick.” The thief obligingly crossed the state line only to be apprehended by AHTA members on the other side waiting for him. The organization was very effective. 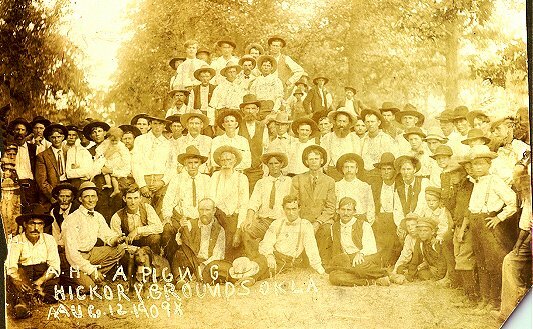 It is stated that from 1899 to 1909 the Oklahoma AHTA recovered stolen horses and other livestock valued at $83,000. Four hundred suspected thieves were caught and 272 of them were convicted. That was just in the state of Oklahoma. Decline in membership started with the advent of World War I. Just like during in the Civil War, many of its members joined the armed services and left the AHTA to struggle on without them. After the war, a depression in 1921 didn’t help much, either. Most members of the organization lived in rural areas. Although the 1920’s may have been a booming time in the cities, rural areas never saw such prosperity; causing membership to even decline further. As automation took over, and horses were used less, stealing them became a misdemeanor offense. 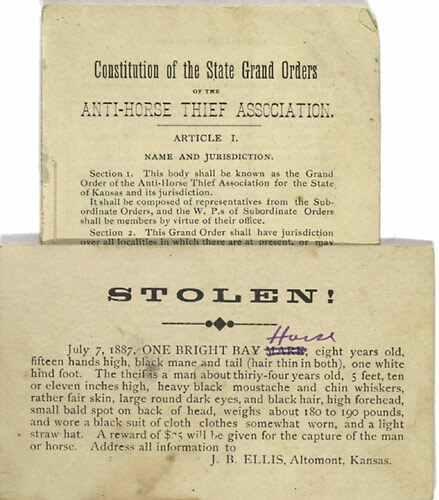 Eventually in 1926, the Anti-Horse Thief Association changed its name to the Anti-Thief Association in hopes of preserving the organization. Their mission was now to detect and suppress all crime. Instead of bolstering the group, many of the older members dropped their membership altogether. Times were changing, and the AHTA had trouble changing with them. The Great Depression made money very scarce in rural areas. Every dollar counted. Undoubtedly, the dust storms from 1933-1939 in the Plains States, caused by extensive drought and inappropriate farming methods resulting in extreme poverty and mass migration also hurt membership in the AHTA. People just had much bigger things to worry about. All you will get, though, is a membership card and bragging rights. Bentonville also has a memorial for the AHTA in their town that was erected in 1961 and a state historical marker. Although the remaining AHTA organizations no longer work to retrieve stolen horses, that does not mean horse theft no longer exists. There are no solid statistics available, but it is believed that between 40,000 to 55,000 horses are stolen each year. It is relatively easy to take a horse, put it in a trailer, haul it to an auction and make a quick dollar. Sadly, many horses that go through an auction end up at a slaughterhouse. This article was written by Judi Daly in cooperation with the Long Riders Guild Academic Foundation, and used with permission by the author.